A doctor (Han Hyo Joo) to be makes a mistake with a patient and her only option to keep her license is to get a firefighter (Go Soo) to sue the man threatening her license. Can she win him over? Love 911 is a typical romcom; two damaged individuals meet and heal each other while falling in love at the same time. Yawn. Nothing special from our main couple acting wise either. Another yawn. What really bothered me about this movie was the fact that after making a mistake the doctors first instinct was to get of the hook somehow. First she only takes the patient in to impress her superiors, makes a biased diagnosis and when she gets told of she tries everything she can to prove she did nothing wrong. She did own up in the end but still, this wasn’t ok. So why did I stick with this movie until the end you ask? The couple below. 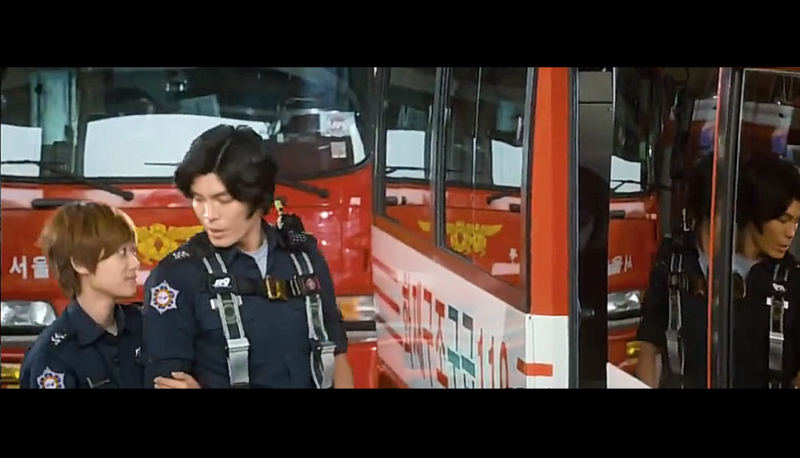 Kim Sung Oh looked great with longer hair and the slowly blooming romance between these two was cute. In the end my patience was repaid when they got together.